Sue has over 25 years of experience in aviation management. She began her aviation career as the Manager of Finance for the Charleston International Airport, and grew with the organization while serving as the Director of Finance and Administration and Deputy Director of Airports. 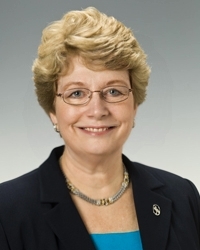 From 2006 to 2013, Sue was the Executive Director for the Aviation Authority responsible for implementing current and long-range objectives, including the strategic direction, development and management of the Charleston International Airport (CHS), Charleston Executive Airport (JZI) and Mt. Pleasant Regional Airport (LRO). During her tenure as Executive Director, she created the CHS Air Service Development Team with key community business leaders and led the effort to recruit a low cost carrier to the Charleston region. This resulted in the commencement of new air service provided by Southwest Airlines (in 2011) and JetBlue (in 2013). She led the team that implemented the Terminal Redevelopment and Improvement Program, an expansion of 100,000 square feet at a cost of $189 million. This project was a complete transformation of the existing facility which included five new gates, new baggage handling systems, a consolidated security screening checkpoint, an upgrade of airline ticketing, and new and expanded concessions. She was also a key member of the community economic development team that led to the decision by Boeing to locate the Boeing 787 Final Assembly Plant at the Charleston International Airport with its $1 billion investment and creation of over 6,000 jobs. Sue is an Accredited Airport Executive and has held a variety of leadership positions in the American Association of Airport Executives, including President of the Southeast Chapter and Board of Examiners for AAAE. She also served on the Board of Airports Council International - North America (ACI-NA). Sue grew up in the metro area of Washington, DC and earned her bachelor’s degree in Business Administration from James Madison University in Harrisonburg, Virginia. She recently earned her Master of Arts in Organizational Leadership from Charleston Southern University. She enjoys living in Charleston, South Carolina and enjoys reading, gardening and travelling.